It's time for more pillow love. To see Before go here. It's time to chang up the house for Spring. and this is the new Spring look. pillow to match. Very romantic. Dollar Tree in February for my pattern. and different shades of buttons on my heart outline. The best glue I found to use for this project is fabric tacky glue. the table without moving it until the next morning. I picked some roses for the night stand. bed spread covering the pillows. I love your spring pillows. Pillows are the magical decorating tool aren't they? How beautiful!! Love the comfy, yet elegant look:) I found your blog through the Favorite Things Blog Hop. So cozy and elegant! I love the muted, neutral colors. I'm glad you shared this at Dishing It! & Digging It! Love your pillows! Spring is here! Betty, your pillows are lovely. I especially like the heart buttoned one and the pillow with pearls on it. The Frenchy ones are lovely too. 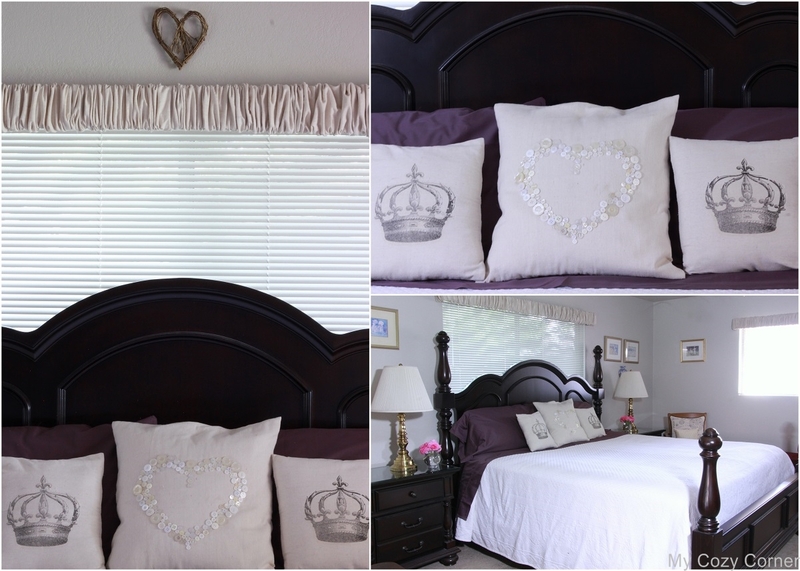 Pillows really do add a romantic touch to the bedroom. Thank you for sharing and linking. Enjoy your day.